Open to any boy age ten or over, the after school clubs are run in partnership with two secondary schools, Weydon School in Farnham and Christ’s College. 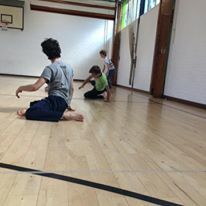 Each week the students work with different artists from TDM, focussing on performance, fitness, contemporary dance techniques and improvisation. All of which have been put to good use – to date the Leg-it boys have performed at G-Live as part of an evening with Ballet Boyz, The Farnham Maltings Big Dance Bus event, Farnham Blooming as part of the Farnham in Bloom competition, to name a few! Rachel Palmer, Director of The Dance Movement, has been pleased with the project’s momentum, ‘I absolutely love enabling boys to dance, the energy the lads bring to the dance studio and their ability to take risks is so inspiring… I am so proud of the lads who signed up for this project… they work relentlessly to make the project the success it is’.